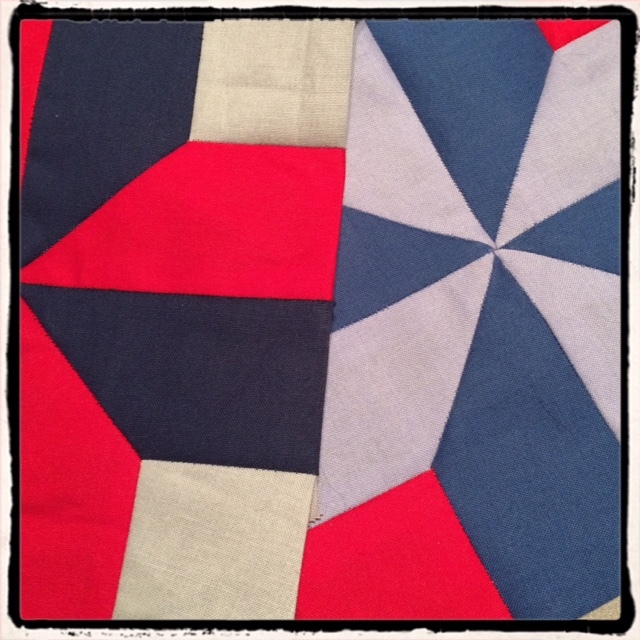 The Nelson Quilt – is there room for me to sew? 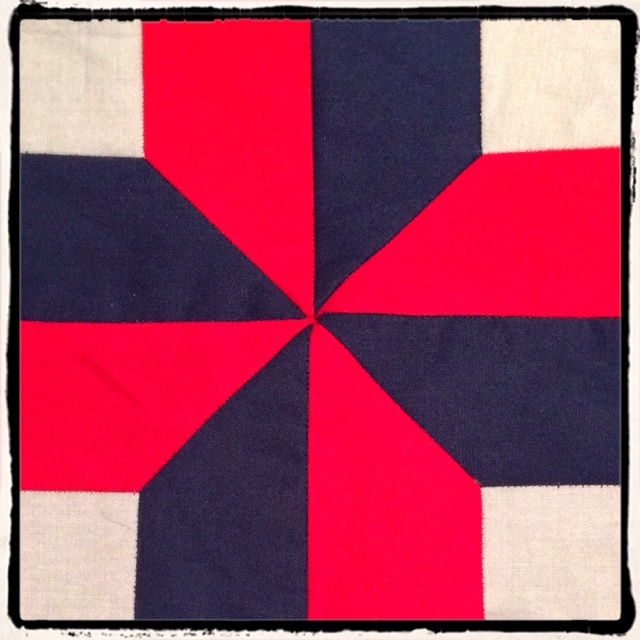 21 October is Trafalgar Day and so it feels very appropriate to feature some quilt blocks (shown above) of a traditional patchwork design known as Nelson’s Victory. The block possibly dates from 1905, the centenary of the Battle of Trafalgar. I haven’t been able to track down much information about this block – other than the fact that there is a similar, but slightly more complicated design called Battle of Trafalgar – so if any historians know about the Nelson’s Victory block, please let me know. 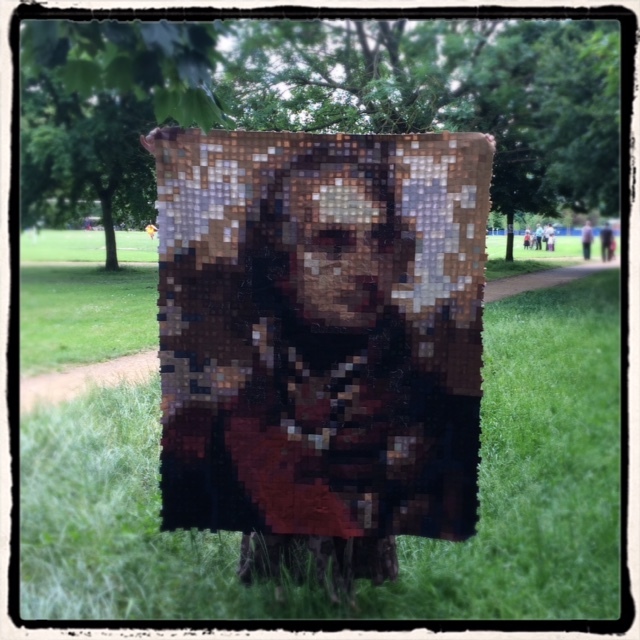 Nelson has featured in a lot of my stitchery this year. 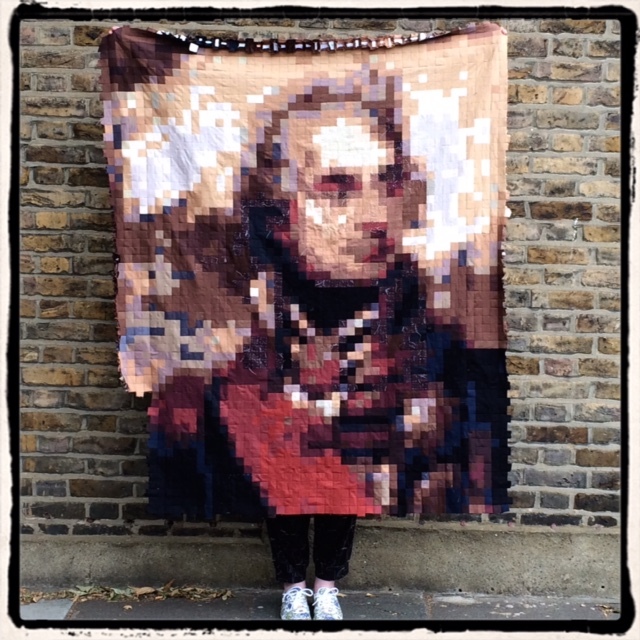 I have just finished a quilt with a design I based on Nelson’s Column, with four panels representing his four major battles of Cape St Vincent (1797), the Nile (1798), Copenhagen (1801), and Trafalgar (1805). In the Spring, I made a small piece to go into the Trafalgar Sail project, a community project organised by the National Museum of the Royal Navy in Portsmouth to celebrate the 250th anniversary of the launch of HMS Victory. As these pieces were inspired by my research into Maurice Elvey’s 1918 silent film Nelson – which sparked my interest in Nelson’s place in popular culture – I am very pleased to have ensured that the Trafalgar Sail, made in 2015, included a reference to Elvey’s film. 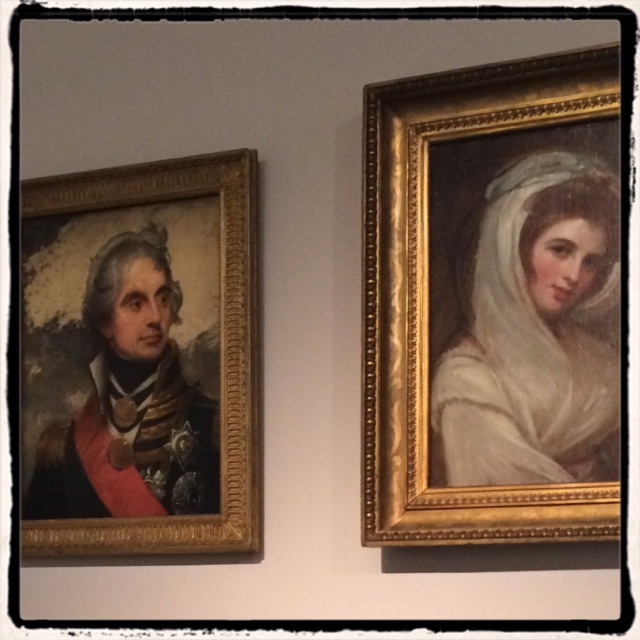 This Trafalgar Day, 21 October 2015, may be the 210th anniversary of the Battle, but Nelson still inspires. I am sure he will continue to do so for centuries to come. In the early hours of Sunday July 5 2015, I finished putting all 3,200 pieces of the Nelson Quilt together. The quilt top is now complete. 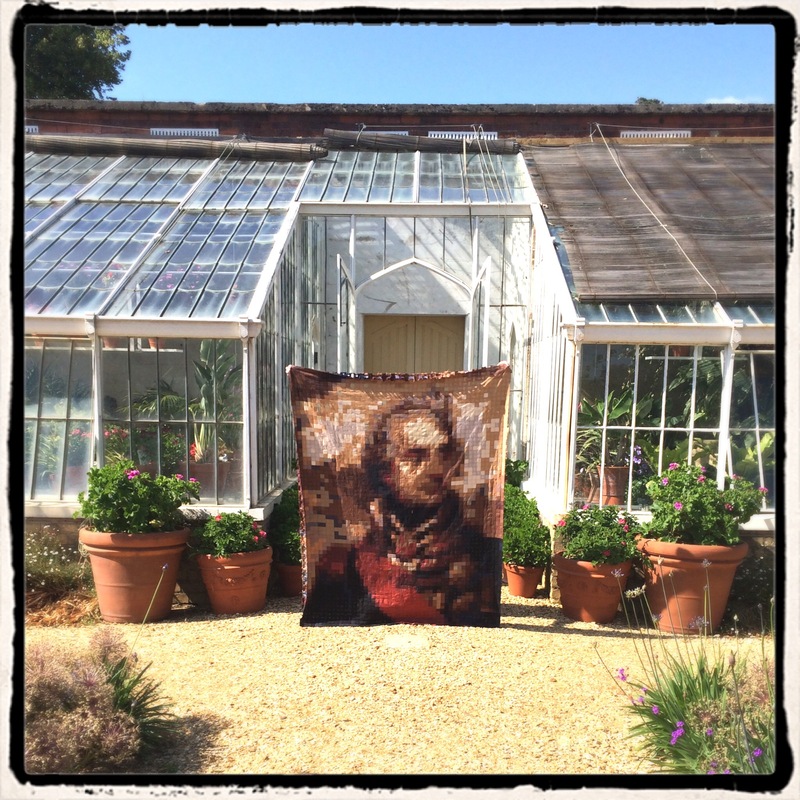 A week later, I visited Osborne House (once the home of Queen Victoria) on the Isle of Wight in order to get some pictures of the quilt in a beautiful location that is particularly relevant to my Nelson project. 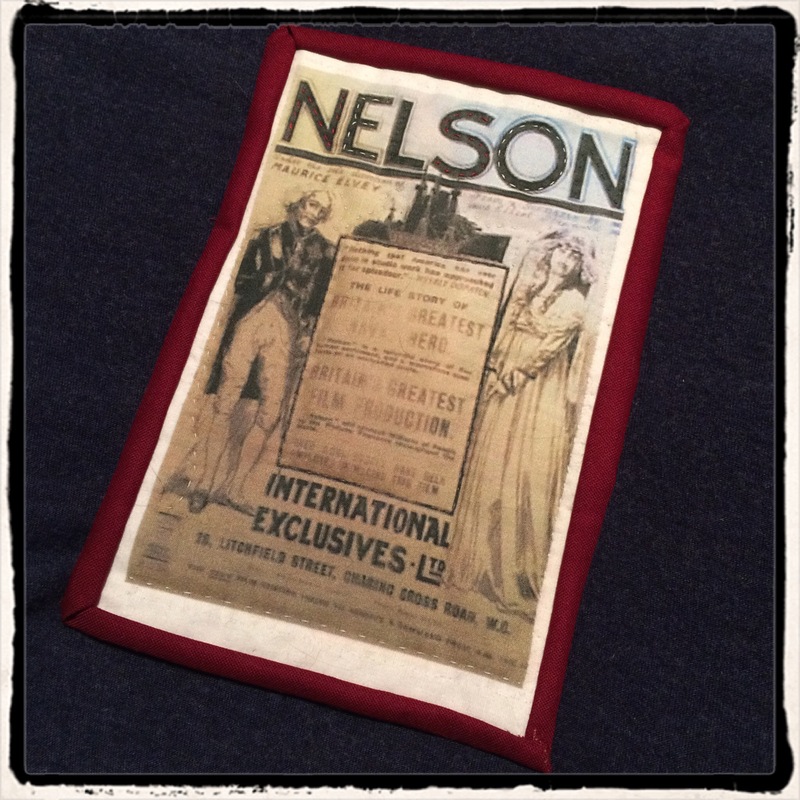 Thirteen months ago, I had the idea for the quilt when researching Maurice Elvey’s 1918 silent film biography of Nelson. I was reading contemporary reports about the making of the film and the locations used – Burnham Thorpe, Portsmouth, Southsea, Torquay. And the Royal Naval College Osborne, in the grounds of Osborne House. The Royal Naval College Osborne was used by Maurice Elvey as the location for a highly fictionalised version of Nelson’s school days at the Royal Grammar School in Norwich. This was a very deliberate anachronism: the College opened in 1903 as a training school for young cadets who would spend an initial two years studying at Osborne before transferring to the Britannia Royal Naval College at Dartmouth (where Elvey would go on to make his 1939 film Sons of the Sea). By 1918, Osborne was known as “the cradle of the Navy” and so, when considering locations for his Nelson film, Elvey chose the patriotic symbolism of Osborne, where the young sailors of 1918 – who might aspire to be like Nelson – were being educated. In Elvey’s film, the schoolboy Nelson was played by a talented young actor called Eric Barker. Barker makes a delightfully irreverent young hero who dons a paper admiral’s hat to lead his fellows in pranks and boisterous behaviour. I haven’t been able to trace the identities of any of the other boys in these exuberant scenes, but I wonder whether they were real cadets studying at the College who were given special permission to have a bit of fun at the request of the visiting film crew? Osborne Naval College closed in 1921, but some of the buildings are still there, including the gatehouse and the Petty Officers’ Quarters, now converted to an English Heritage shop and restaurant. When Elvey was filming scenes at the Naval College in the summer of 1918, parts of Osborne House were being used as an officers’ convalescent home. In the Elvey film, there are some scenes of Nelson visiting convalescent sailors after battle, and I have a feeling that these scenes were also taken at Osborne. Other parts of the House were open to the public for guided tours. I don’t know if Elvey took the time to visit, but I like to think that he did. 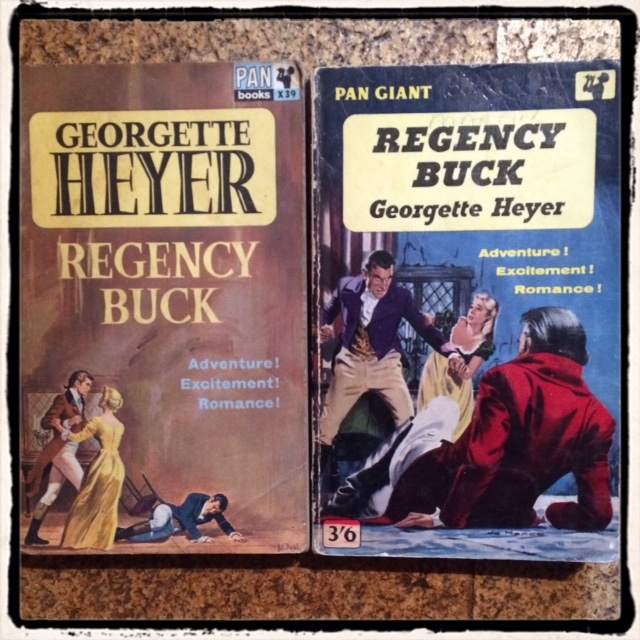 This post contains spoilers about Georgette Heyer’s Regency Buck. A sewing session provides a perfect opportunity to get lost in a good audiobook. I have spent many happy hours listening to the novels of Georgette Heyer – the perfect sewing companion – and was delighted when, on 5 June, 2015, her childhood home, 103 Woodside in Wimbledon, London, was given a Blue Plaque by English Heritage. 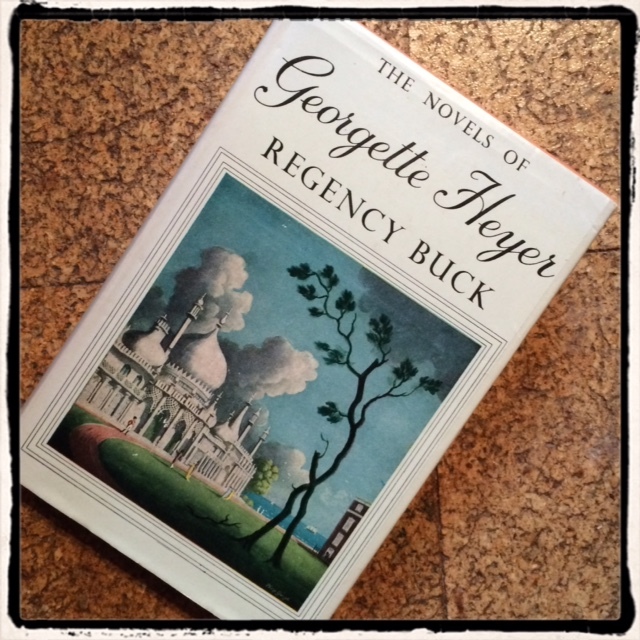 Earlier this week I was listening to an old favourite – Regency Buck (1935). This was Georgette Heyer’s nineteenth book and the first set in the Regency period (1811-1820). It isn’t my favourite Heyer novel but I have a soft spot for it because it was the first of her novels I read. I love the strong heroine, Judith Taverner, who flouts convention by driving her curricle to Brighton in an unladylike race with her brother, takes snuff, battles against the restrictions places upon her by her guardian, and ensures that looking like a mere Dresden china miss is offset by a decided air of resolution in the curve of her mouth. To relieve the awkwardness of the moment she turned to the Admiral, and began talking to him of the Trafalgar action. He was pleased enough to tell it all to her, but his account, concerned as it was merely with his own doings upon that momentous day and interspersed with a great many oaths and coarse expressions, could be of little interest to her. She wanted to be hearing of Lord Nelson, who had naturally been the hero of her school-days. It was her uncle’s only merit in her eyes that he must actually have spoken with the great man, but she could not induce him to describe Nelson in any other than the meanest terms. He had not liked him, did not see that he could have been so very remarkable, never could understand what the women saw in him – a wispy fellow: nothing to look at, he gave her his word. He was not at all difficult to talk to, and they had not driven more than half-way round the Park before Miss Taverner discovered him to have been a firm friend of Admiral Nelson. She was in a glow at once; he was very ready to talk to her of the admiral, and in this way they drove twice round the Park, extremely well pleased with each other. I hadn’t picked up on the Nelson references in Regency Buck before. I probably wouldn’t have paid them much regard had it not been for the Nelson research I’ve been doing as part of the Nelson Quilt project. 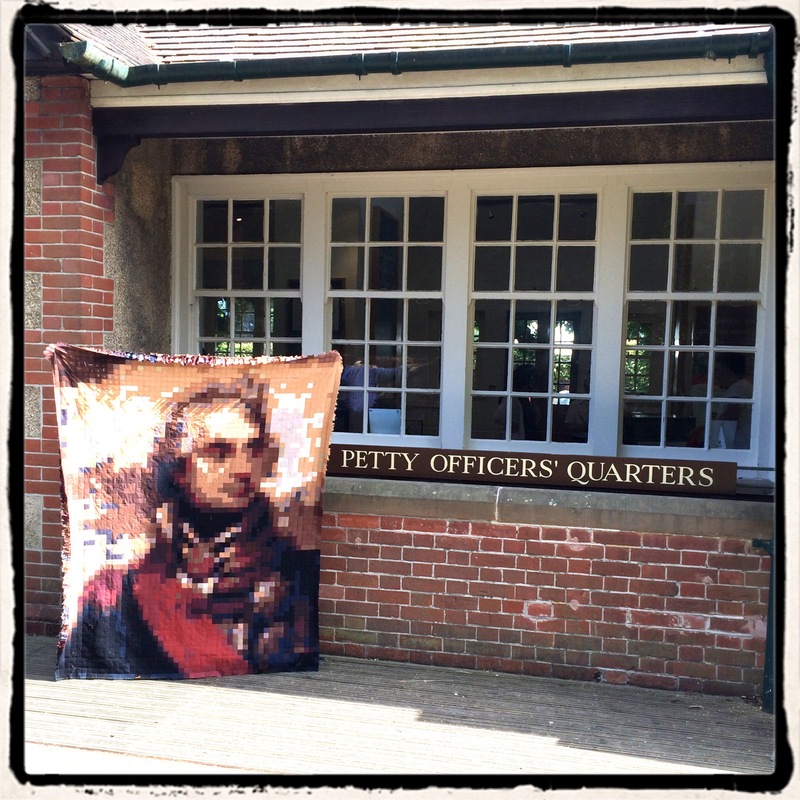 The Nelson Quilt at 2,900 squares: 28 June 2015 – 300 squares to go. 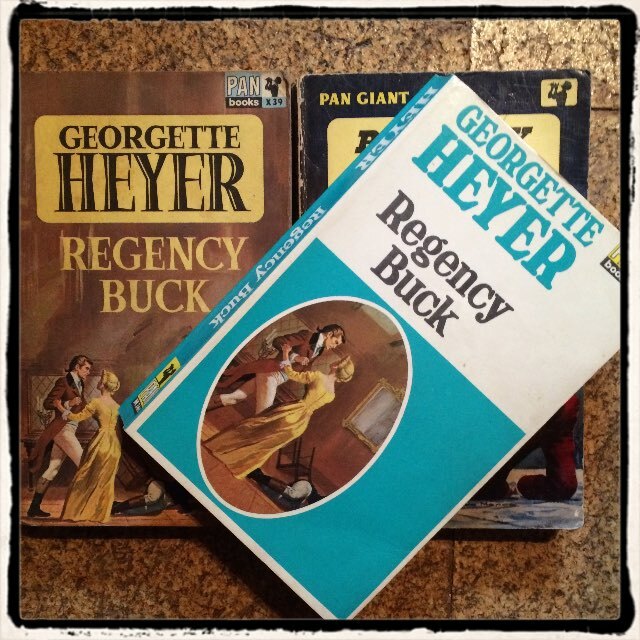 Georgette Heyer was a meticulous researcher and very knowledgeable about the period and people of whom she wrote, weaving real events and individuals into her narratives with great skill. Judith Taverner’s admiration of Nelson would have been no accident. I’m really pleased to have found it and understood its significance while working on my own Nelson project. 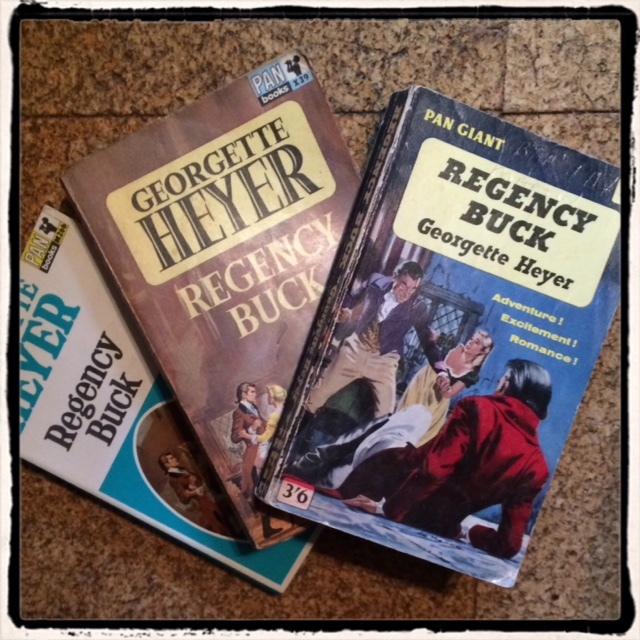 Georgette Heyer’s Regency Buck: Adventure! Excitement! Romance! 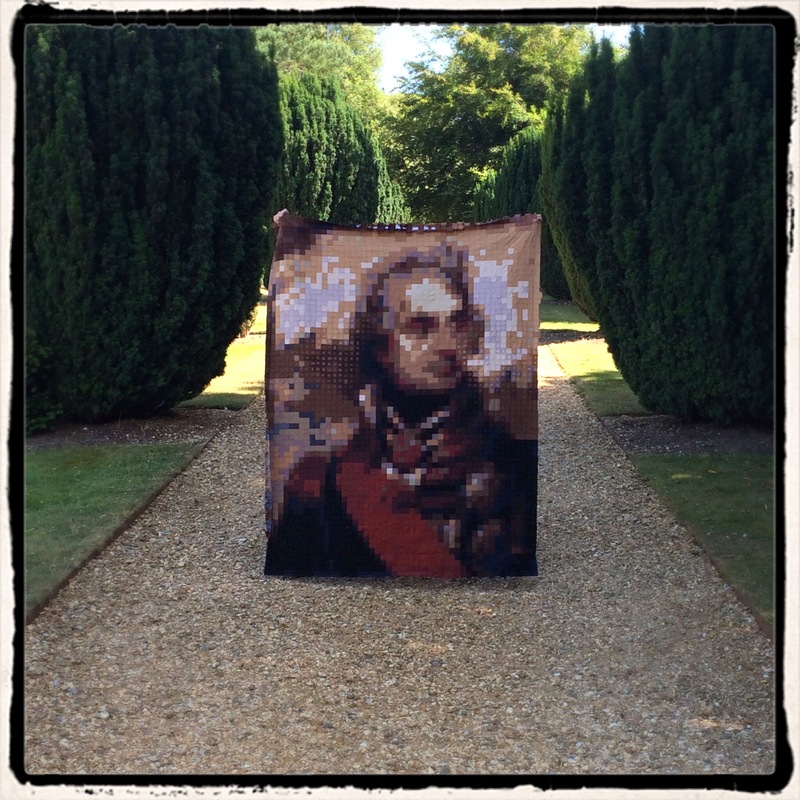 I have just looked at the calendar and realised that I started the Nelson Quilt a year ago today. The project still isn’t finished but, in terms of piecing the squares, there isn’t that much more to do now. Soon I’ll have to face the challenge of working out how to quilt him! The last year with this project has been so exciting. 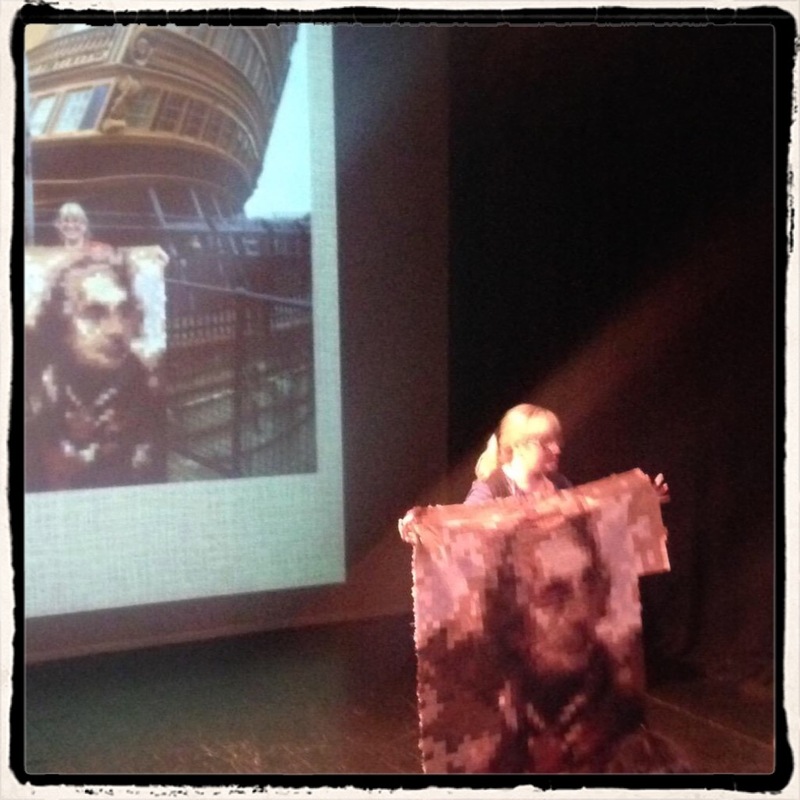 From an idle question (“I wonder what Nelson would look like as a quilt?”) to speaking at the NoRMMA Network‘s Performing Stardom Symposium about Nelson’s place in World War One film propaganda and the link between research and creativity, I have never felt so energised by a sewing project. It feels strange to say that a quilt project can enhance film research but I have definitely found this to be true. 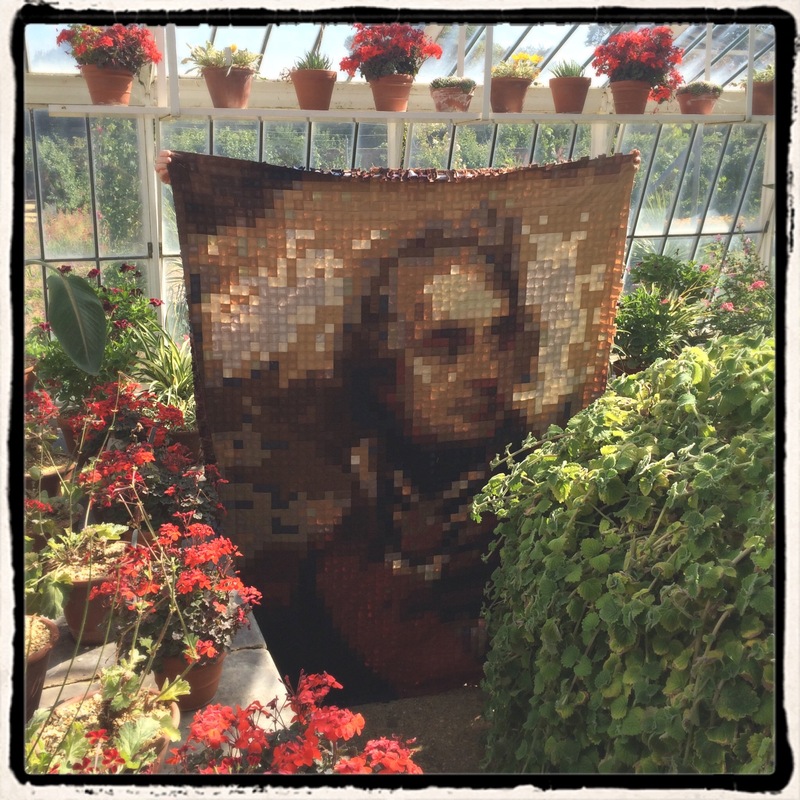 Had I not started the quilt, I would not have become so interested in seeking out Nelsonia, visiting Nelson-related locations and finding out about the long legacy of sewn Nelson commemorations. All this additional research has definitely enhanced my understanding of the 1918 silent film about Nelson, directed by Maurice Elvey, and why it was such a significant piece of film propaganda at the time. 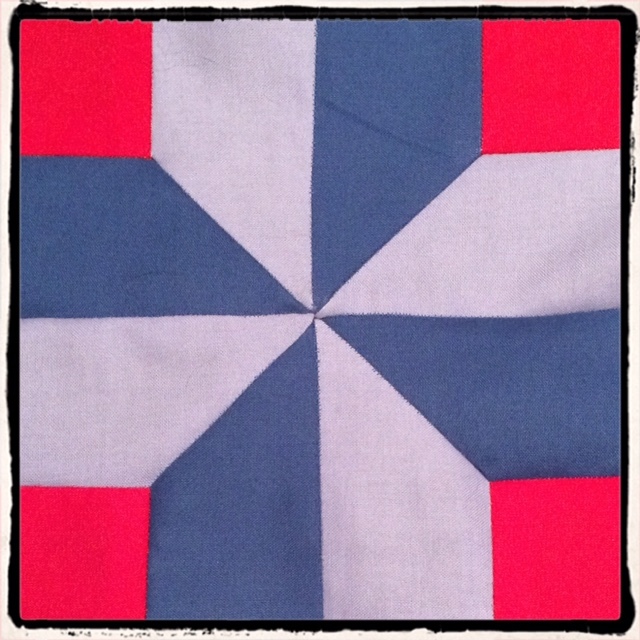 This quilt started out as an experiment – and proof of this remains in some of the fabric squares. Anyone who looks closely will see that the weave on some dark brown fabric is looser and the squares therefore slightly thicker than the rest of the quilt. Why? Well, when starting out, I wasn’t sure if the project would work or whether it would be something I would try for a couple of weeks and then abandon. When I found I hadn’t bought the right shade of dark brown for the quilt, I used whatever was to hand – in this case a different weave of fabric – because at that stage it didn’t really matter. By the time the project had grown to a reasonable size I thought about replacing those squares but didn’t get round to it. And now I like the evidence of the uncertainty and ambivalence of the early stages of the project. It reminds me that sewing can take one in unanticipated directions and can lead to so much more than one ever expected. 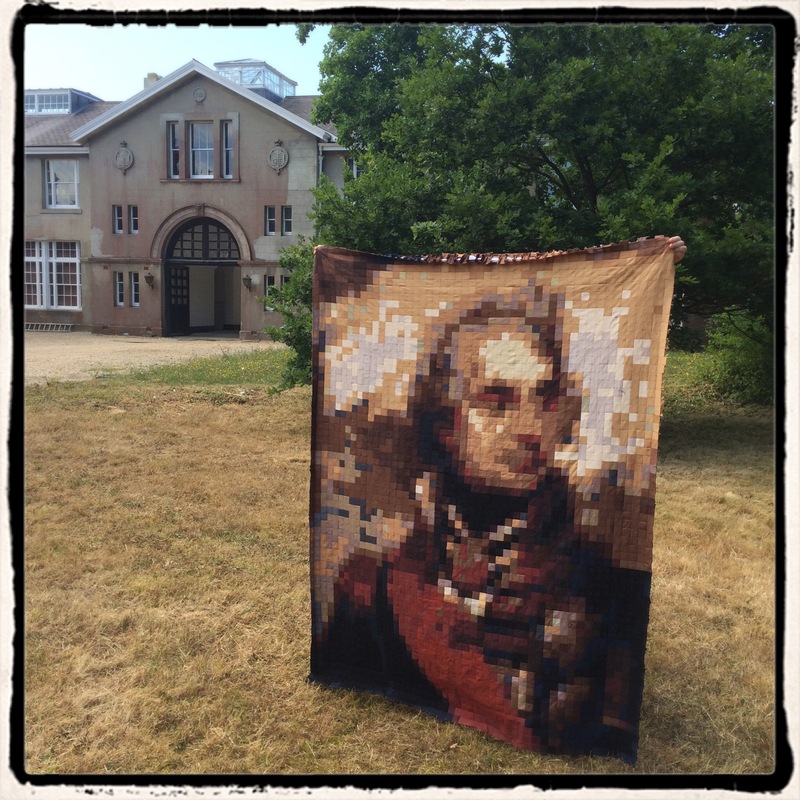 The Nelson Quilt – June 2015 – one year on. 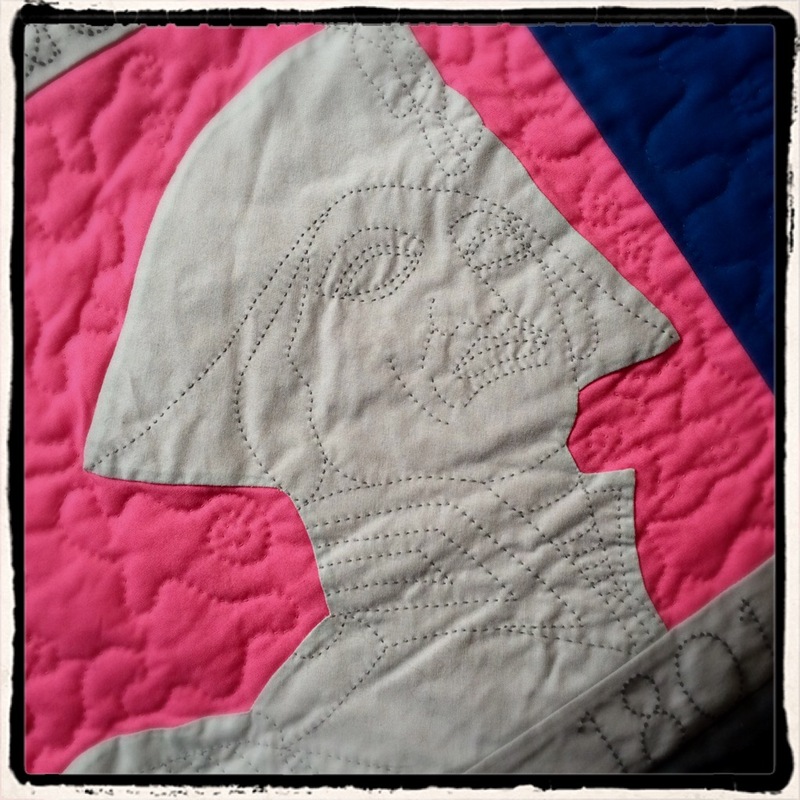 Over the last few weeks, I have been having a slightly frustrating time as a result of working on the Nelson Quilt. All the stitching over papers using the English Paper Piecing technique has strained my arm and I have developed tennis elbow. 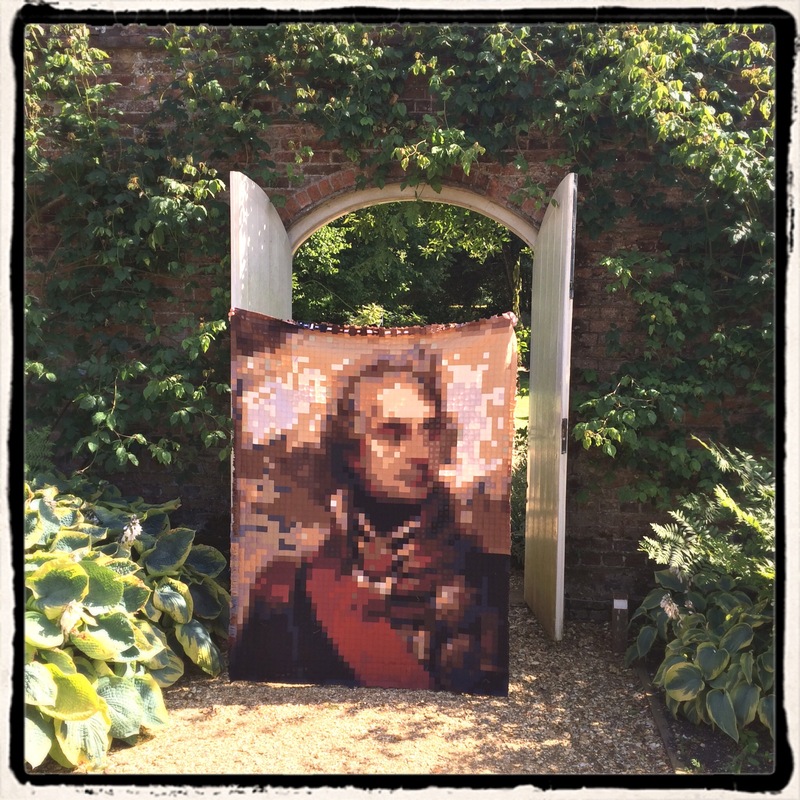 So no progress is being made on the Nelson Quilt at present, but that does not mean that the associated research project has ceased. 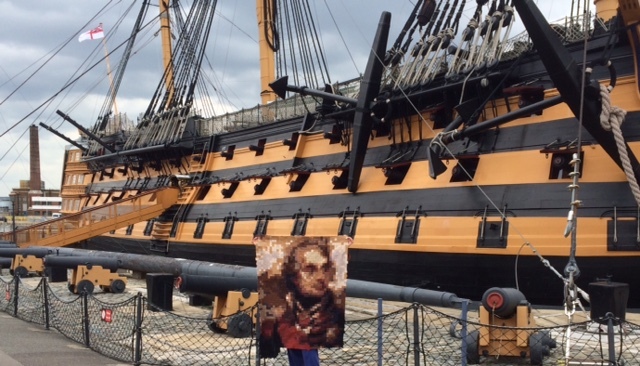 On Friday 1 May I took the Nelson Quilt to Portsmouth Historic Dockyard. 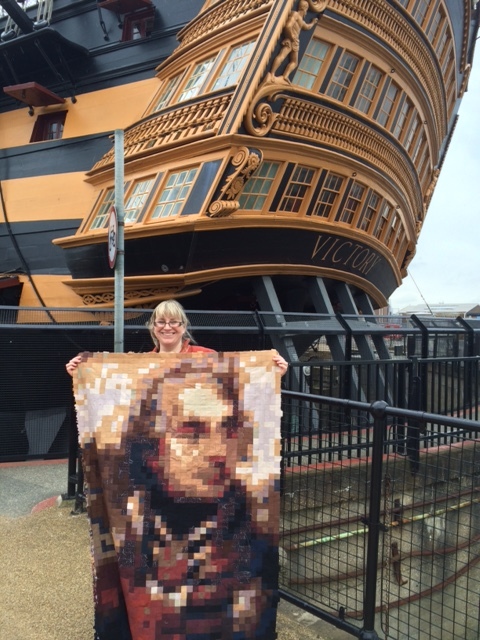 I wanted to visit HMS Victory as part of the preparation for a paper I am giving at a conference later this month about how research into Maurice Elvey’s Nelson film led to my making the Nelson Quilt. 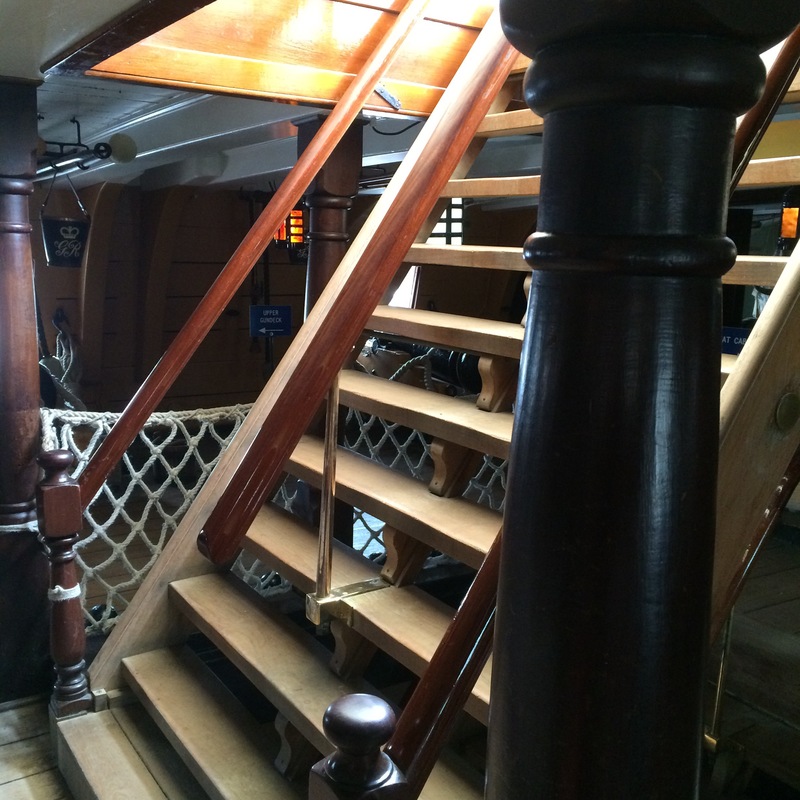 Visiting HMS Victory is fascinating. Nelson’s flagship at the Battle of Trafalgar represents an important piece of Naval history and there are many well-informed guides on board who are keen to share their knowledge of and enthusiasm about the ship, Nelson and Trafalgar. 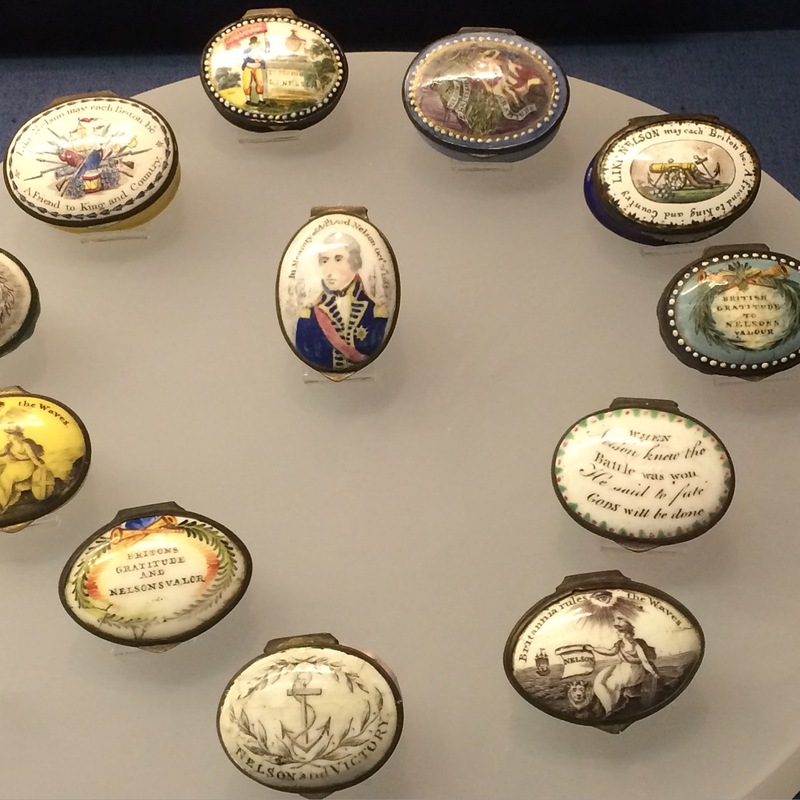 On this visit I learned about the latest theories about the damage to Nelson’s eye (damaged not lost and he did not wear an eye patch); his migraines; and his role in promoting his own image as hero. 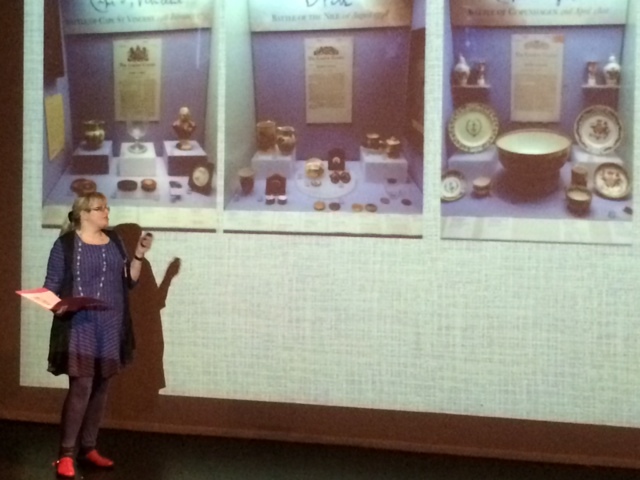 I found out about cooking on board and the type of food available to the crew; how the crew stashed their possessions during the chaos of battle; and the heirarchy of dress in the Royal Navy in the 1800s. 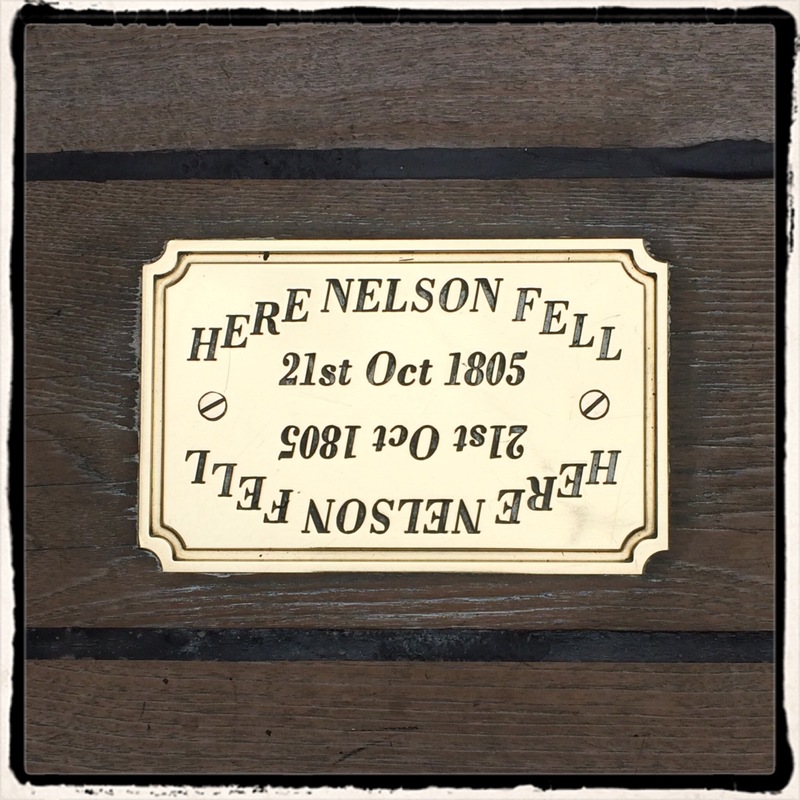 I also learned details of Nelson’s fatal wounding at the Battle of Trafalgar and how, his face covered to try to hide the news of his injury spreading amongst the crew, he was carried down the steep steps from the quarter deck where he fell to the orlop deck where he died. I also had some time to reflect on some more recent events on the ship. In 1918, Maurice Elvey was given special permission by the Admiralty to film scenes on board HMS Victory for his Nelson biopic. In Elvey’s own words, “the Admiralty let me work on the Victory, actually in the cockpit. 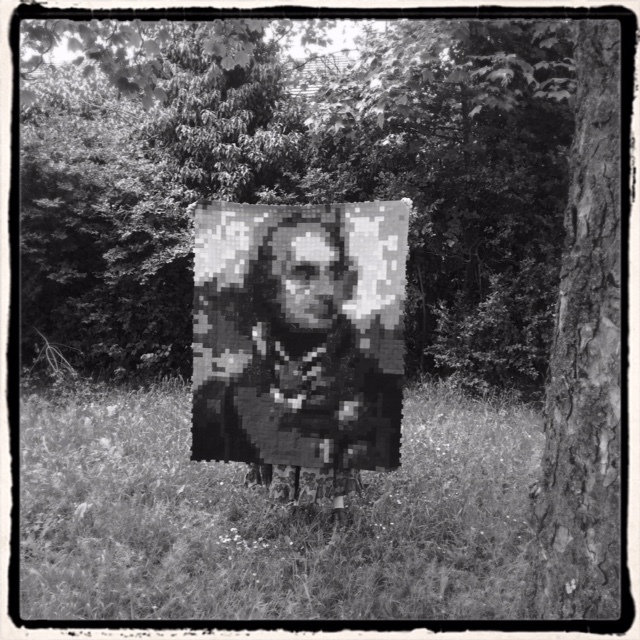 The most moving thing I’ve ever done was to reproduce the death of Nelson. This was something that frightened me – I’d never do such a thing again.” I can’t help thinking of Elvey, his camera operator, Mr Frenguelli, and the rest of the film crew struggling up and down the steep steps on board with very heavy camera equipment. And in 1918 the ship was not in dry dock but on the water, so the movement under foot must have added to the challenge. Portsmouth Historic Dockyard is well worth a visit. Not only is HMS Victory there, but it is also the home of the National Museum of the Royal Navy (which has an excellent gallery of Nelsonalia); the Sixteenth Century flagship, the Mary Rose (an astonishing feat of maritime archaeology and preservation); and a whole range of other fascinating things to see and do. Visitors can also see Nelson depicted as a ship’s figurehead. 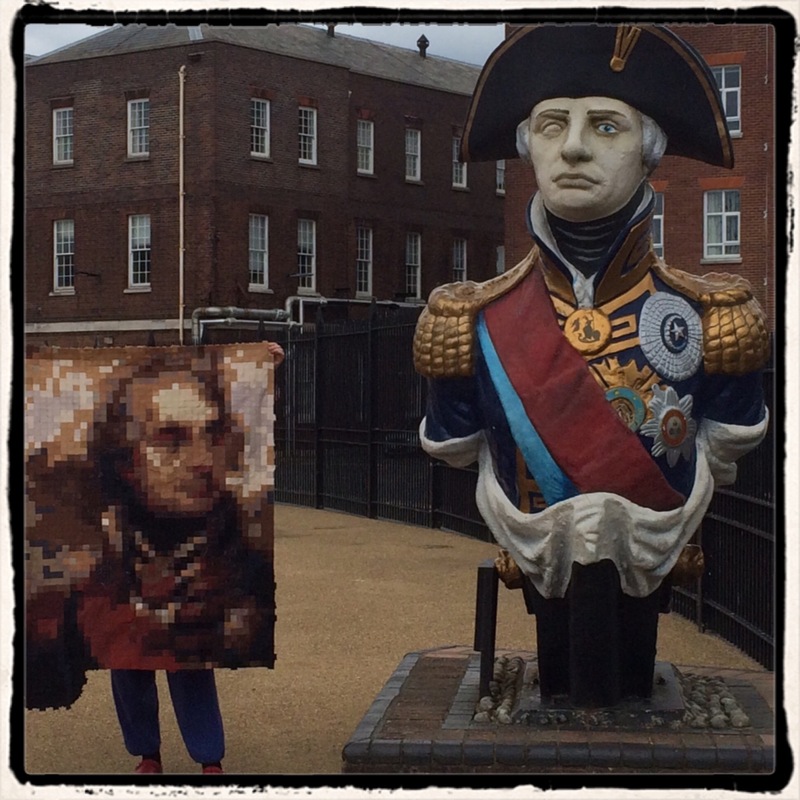 Originally from HMS Trafalgar, a ship launched in 1841, this towering bust shows Nelson in full dress uniform – and is now a fitting way of greeting those who visit HMS Victory today.